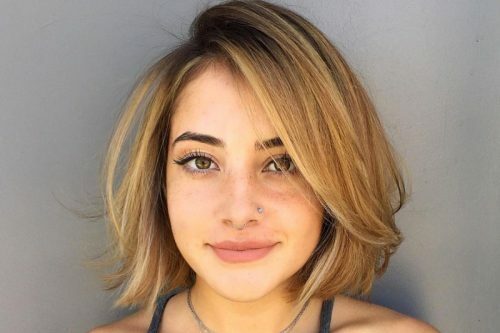 Short brown hair is an all-time classic that is in all manner beautiful. It’s the ultimate canvas for any dye job or cutting style without the worry of upkeep. 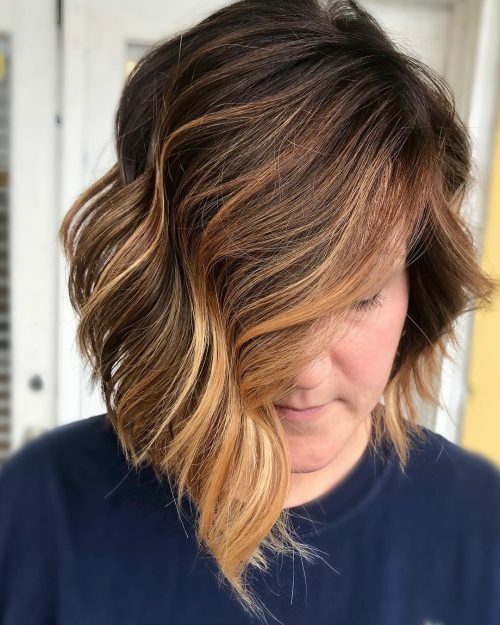 From balayage highlights to subtle ombrés, you can take your basic brown hue to the next level. Who wouldn’t want a look that could save you time and budget without sacrificing your sense of fashion?! Although, styling and maintenance really depend on your lifestyle. 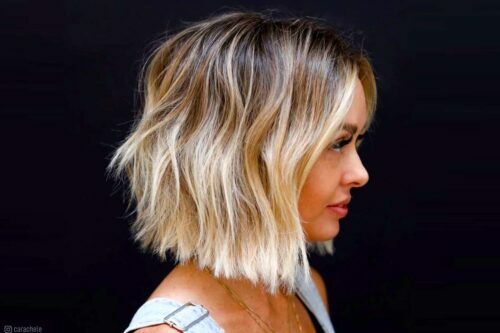 If you plan on keeping it short, then regular visits to your hairdresser are a must, but if you’re up to adjusting with the grow-out then this look would be a wonderful choice for you to try. 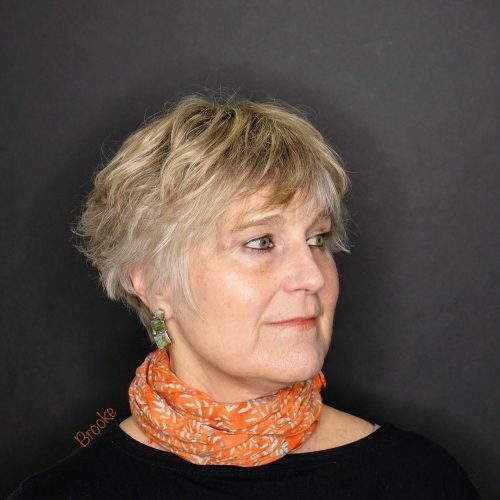 The marvelous thing about a short chop is the edgy and dramatic change it gives to its wearer. A brunette-based pixie or bob makes the cut even more voguish and dimensional, as it provides a natural shadow. 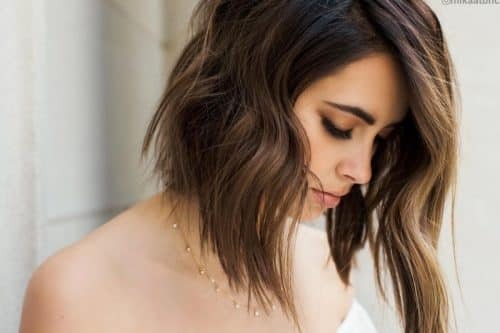 Give yourself a lovely treat by clicking through this updated compilation of different ways to style a short brown hair of various textures, lengths, and colors! Chop chop! This beautiful undercut with a deep side part and long side bangs will bring out your inner chic. A little triangular graduation can add a lot of edge to your tresses. 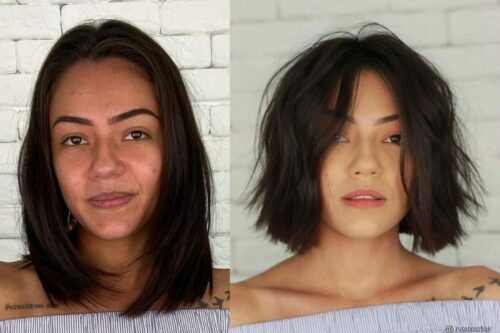 This A-line bob could also look much more charming with some flirty side fringe pieces. 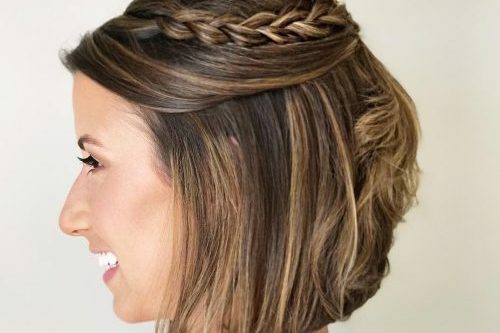 Even with neck-length hair, you can still have beachy sandy waves on your hair! Style with choppy ends and a shadow root for stunning depth and texture. Perfect texture comes from an exquisite haircut like this complemented by subtle blonde highlights. With little to no effort, you’ll have a chic look instantly. Spiced up your brunette base with a toffee balayage for the fall season. 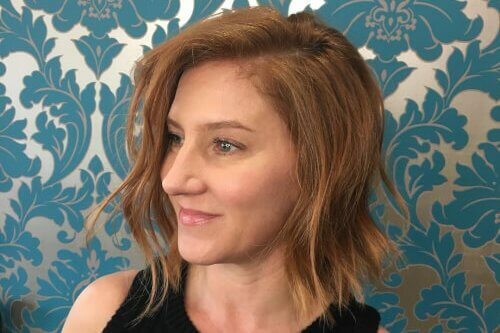 An angled textured cut like this pairs marvelously with a nicely done balayage. 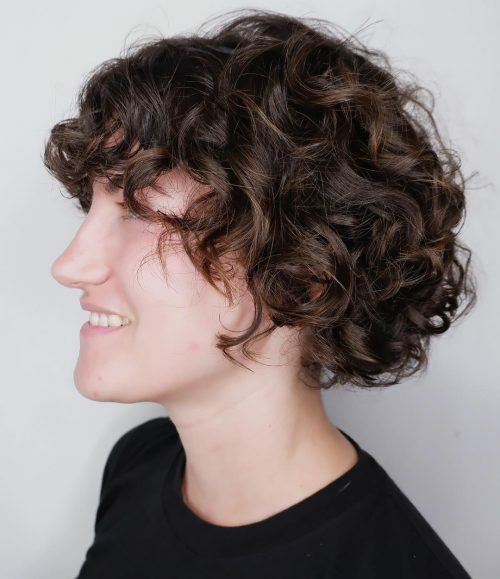 This one’s a phenomenal style using natural dark chocolate curls cut short to perfection! A shag with a cute fringe like this will save you the time of maintenance and styling. 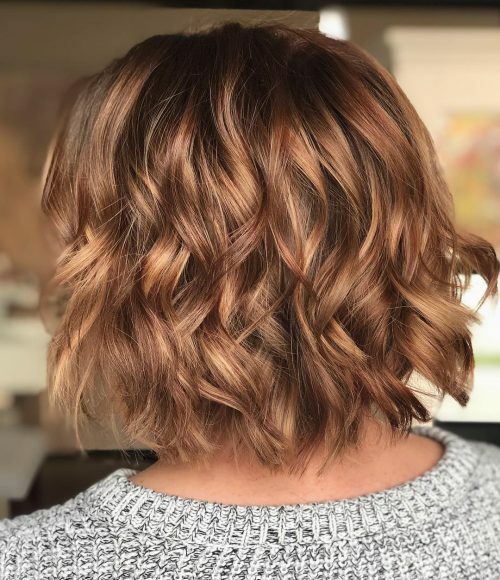 Own this natural iridescent look from this vibrant caramel color with warm tones! 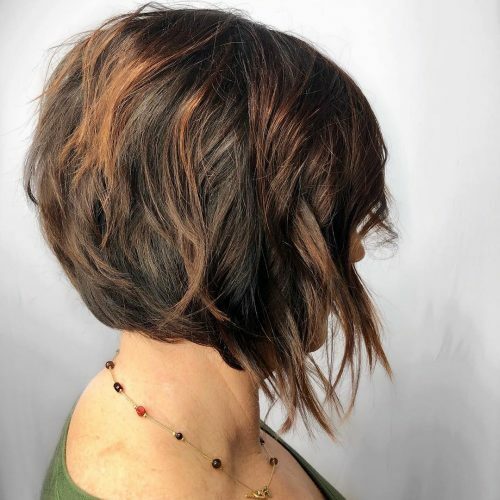 This textured and dimensional bob is a proof of how this stunning shade can transform a classic haircut. 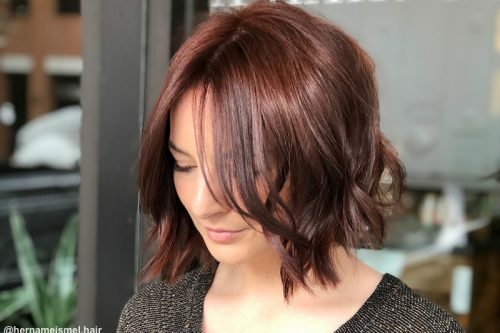 Look fantastic with this cute chocolate dye job on a layered bob! It’s simple, easy to maintain, and effortless to style! 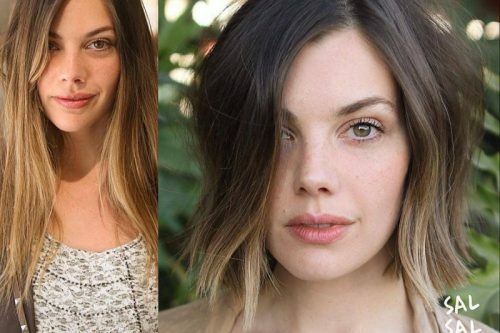 Complement your cute layered bob with some caramel highlights for added depth. It also helps accentuate those precisely done layers. 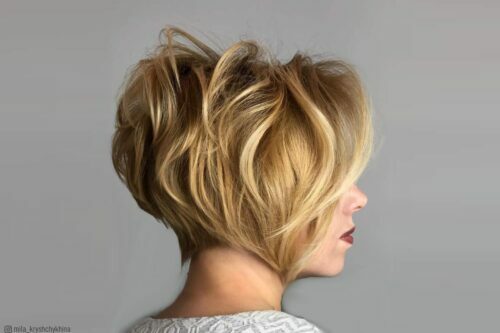 This look is a long textured pixie cut with lots of point cutting to create a more piecey style. With both dark and light tones in the hair, it really brings out some nice contrast that makes the cut appear more choppy. 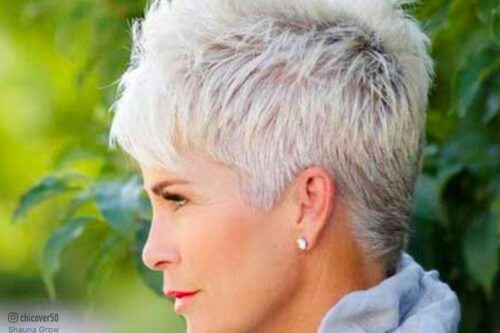 I think this look is for someone wanting a fun stylish short cut with styling versatility. It can be styled easily with a defining cream or paste for a tousled effect or for a more groomed look. You can blow it dry with a round brush. This style will take your hair to the next level and give it a contemporary look. I absolutely love cutting short hair, it’s my favorite! 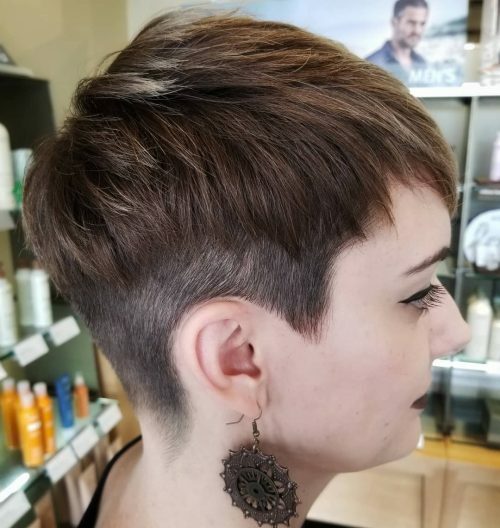 I like the look of an undercut on a pixie because it adds texture, movement, and interest. It also removes any unwanted weight so it’s great for anyone with thick, coarse hair looking to get rid of bulkiness. There is also great versatility with styling. You can wear a deep side part to expose the undercut, or you can move the part closer to the middle for a different look. 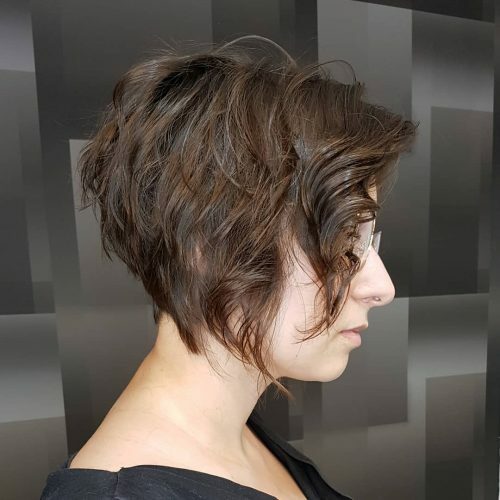 Whenever I have a client who is considering going from a longer length to a shorter style like this, I always like to gauge how ready they are for a shorter cut. I ask how long they’ve been considering the cut and how willing they are to come in more often to maintain the style. I definitely take face shape suitability into consideration. Sometimes I will sweep the hair away from the face and mold it into the shape we will be creating so the client can see how it might look. Depending on the hair texture, I will recommend appropriate products, which are a must with short hair! 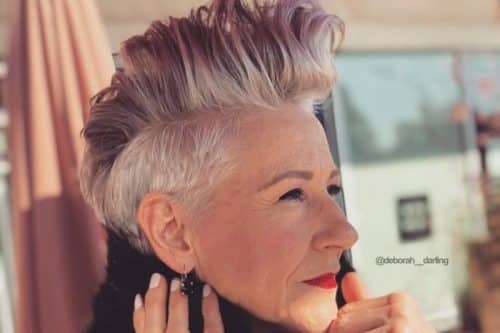 If you’re going to have short hair, you need styling products like a sea salt or thickening spray for texture and grit and a pomade or wax to hold it in place or give a lived-in, messy feel. My client pictured has super fine hair so I used Dallas thickening spray from R&Co on wet hair, rough dried with my hands, and then used a brand new R&Co product called Sandcastle to give it definition and texture. 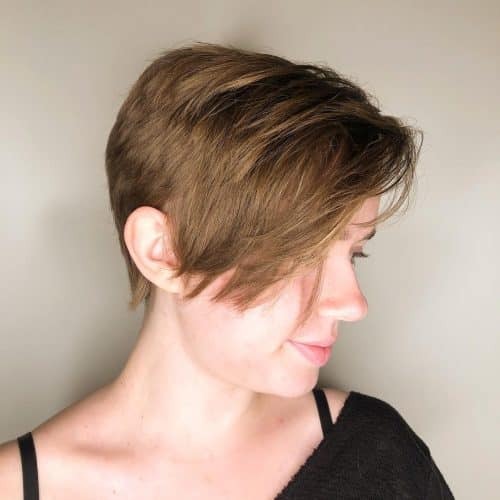 This is an edgy undercut pixie with a natural brown color with diffused, grown out highlights on top. 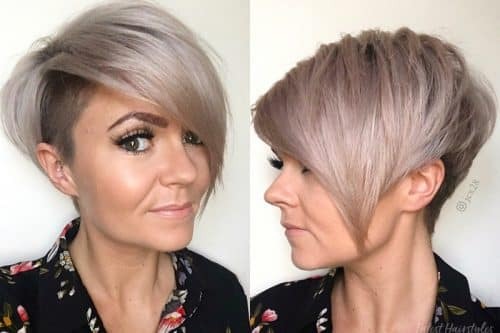 The best part of this cut is that a woman with lots of dense thick hair who wants a pixie tend to look like a helmet head really quickly, and the undercut is a perfect way to get rid of weight and have a cute pixie cut that lays nicely for them. Styling is key with this haircut. 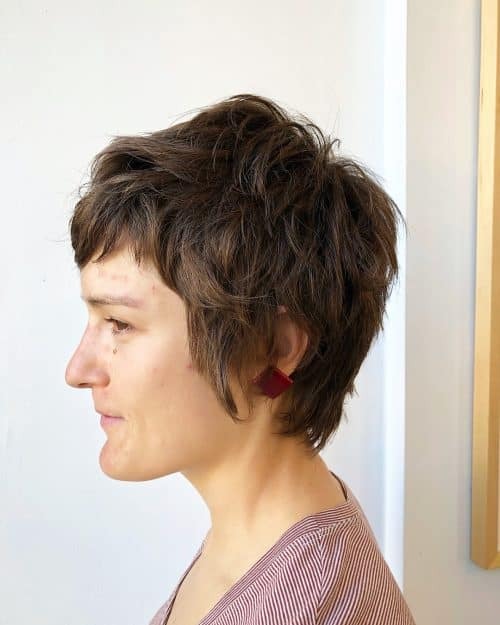 This haircut is great for really thick haired guests. Using a smoothing product to help frizz and to help make the hair nice and flat is key. Also, don’t forget to use a heat protectant! Go in with a blow dryer and a flat brush and blow dry the hair flat onto the head following the head shape. You can follow with a flat iron for extra smoothness and then piece it out for my texture and funkiness with some sort of paste to hold it in place. This cut will need to cut every 3-4 weeks to keep this still fresh and in shape. This color is actually considered a color correction! My client Angie came to me with black box dye in her hair on top of the previously lightened hair. Using the black and adding lighter pieces give it the tiger’s eye effect. I used Joico Blonde Life lightener to highlight and Joico Lumishine Liquid Demi to tone. The cut is simple. She is growing out an old pixie cut, so I just shaped up the back to meet the length in the front. Styling wise, I used my flat iron to crafts these waves and finished the look with Joico Beach Shake which is a texturizing spray to break up the waves and give it a very lived in look! This look was created to slowly and safely remove black box dye out of the hair. She is trying to grow this cut out so adding extra damage from the lightening process was not an option. We safely removed the color using Joico. She has super straight, thick hair so adding a wave texture will add some extra drama. She has a sassy personality who needs a sassy look! It’s a short wavy grad bob. The greatest thing about this look for me is the loose waves and fringe that add a nice texture to it, as the cut was very short and sharp. This look suits most hair types and is quite low maintenance, excellent for clients with little time to do their hair. It was blow dried with styling mousse and a tiny drop of oil, then a curling wand was used to finish. 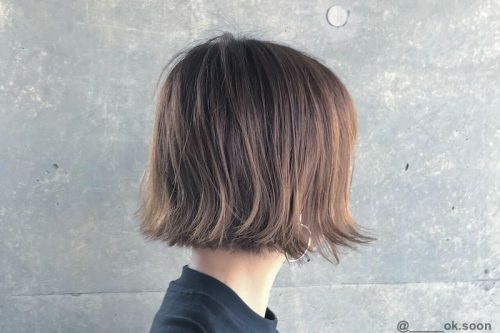 This is what I call a textured bob. 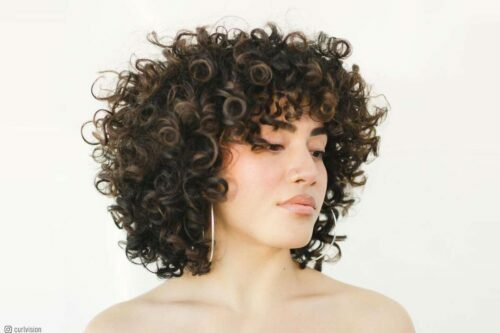 It’s low maintenance – you can style it straight, curled, or with just a quick bend with the curling iron which is nice for someone who doesn’t want to spend a ton of time styling their hair every day! This woman had a heart shaped face but I have yet to meet someone who couldn’t pull this look off! It can be chic, flirty and low maintenance depending on how you want to dress it up or down for your day or occasion! This look is a short shag. This cut will look good on any face shape by detailing the front face-framing pieces to the individual’s facial structure. The color also helps accent certain aspects of the cut by popping in balayage pieces around the face. If you decide to get this cut, it is so low maintenance. All you need is a good sea salt spray or dry texturizer spray for that lived in look. 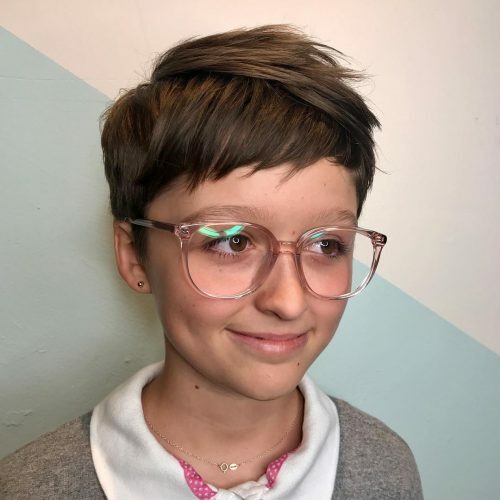 This style is a pixie shag – a great style for a client who doesn’t fully want to commit to a pixie cut and wants a low maintenance wash-and-go style. l love that it really emphasizes the client’s natural texture and hair color. 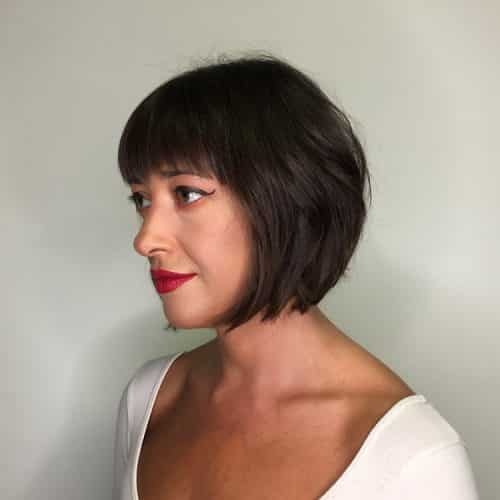 Her soft, yet longer, fringe around the face and hairline help to create a more feminine look and sets this cut apart from the standard short hairstyle. I believe this shag can look great on all hair types. It’s for the clients with medium to thick hair who want to go short but are scared of feeling like a “mushroom” or those fine haired clients that need a little bit more volume/fullness. It’s also best suited for the oval face shape or stronger jawline. I wouldn’t recommend it for the rounder face. The client pictured is an avid cyclist and altogether has an active lifestyle. 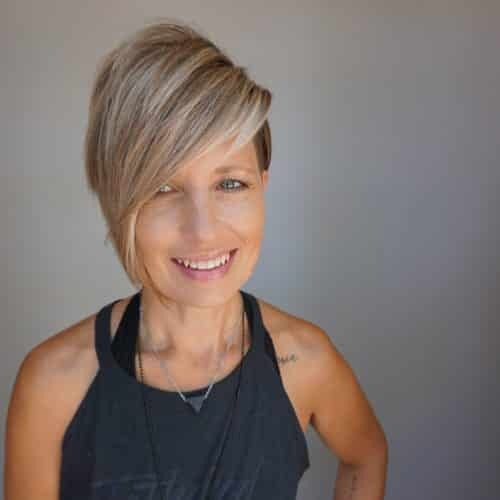 This cut works great for her because she can throw some product in, after taking her bike helmet off, mess it up a bit to still look and feel amazing! Products: In the photo, I used, and am currently in love with, the FATBOY SPRAY PUTTY (for flexible matte hold). It helps give hold and separation without making your hands and hair feel sticky like you sometimes get from a pomade. 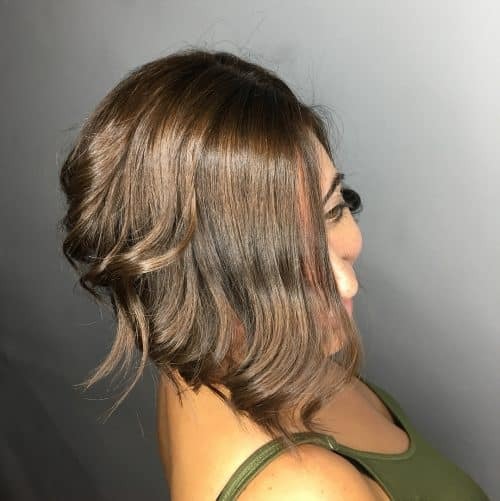 This look is a traditional pixie with longer texturized layering throughout the top, a piecey fringe, and a blunt cut around the hairline for a little edge. Her hair color is natural but I would communicate it as a medium natural brown and slightly lighter through the ends. I love how versatile this look is in its wearability and styling. It’s a cut you’d get a ton of compliments on! Short hair is so fun. I think everyone should try some sort of short style in their life. Even if you think it wouldn’t suit you, you’d be surprised. There is a short style out there for every face. Elements of the cut can be slightly altered with a style like this to customize it to your face shape, hair type, and lifestyle. A longer fringe, softness around the ears, or more length around the sides would all be things that could be changed to suit the wearer. You should be prepared to visit your stylist often if you want to maintain the look of a shorter cut, at least every 2 months. I think a little product always helps to define and polish a cut like this. A light pomade, wax, or texturizing product would all work depending on your hair type and what you like to use. 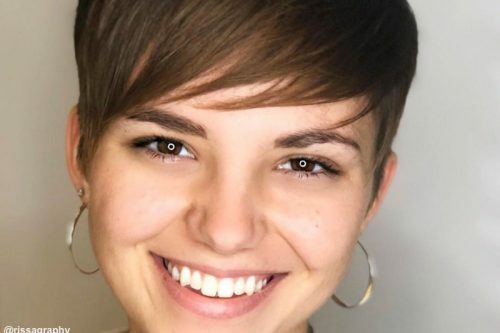 This short brown hair cut is about being a little edgy. I added some layers and over-directed hair on top to maintain the length. 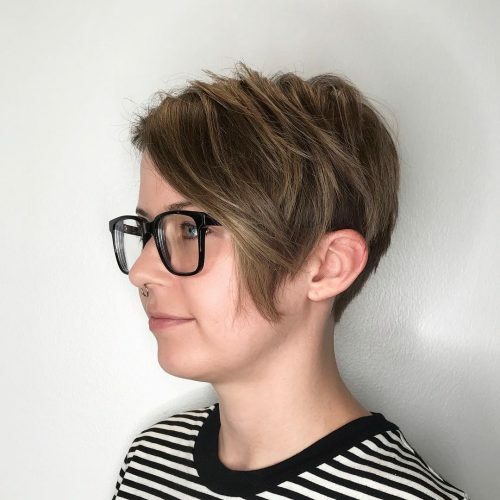 My absolute favorite part of this haircut was the refinement and texturizing! I used a lot of slide cutting and point cutting techniques that made the end result exactly what my client wanted! Although it was a little bit of a challenge, this haircut was so fun to do! 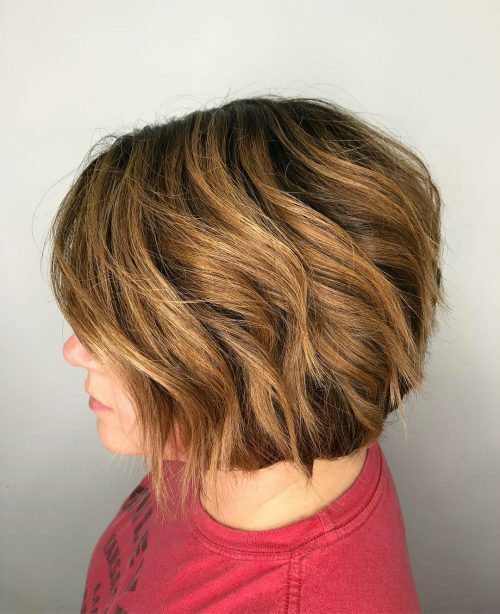 If you are going for a more texturized, lived-in look, I would definitely recommend Paul Mitchell’s Invisible Wear Pump Me Up and Undone Texture Hairspray for this styling this haircut!